Since loading Mojave I have not been able to get Touch ID to display. Running Mojave version 10.14 on a 2017 MacBook Pro. Touch ID is activated in System Preferences and in 1Password. (See screen grabs below). In 1P Preferences>Security, I unchecked "Allow Touch ID to unlock 1Password" (and was prompted to enter my Master Password). I then rechecked it to reactivate (again entering my Master password). I then quit 1P, and relaunched it. Both the client app and the Chrome browser plugin prompt me to enter my Master Password. The client app does not display the clickable thumbprint that normally appears when Touch ID is activated. Welcome to the forum, @kinseywilson! Did you recently migrate your Mac from another Mac, using either Time Machine or perhaps Migration Assistant? No. Purchased the machine in March. No migration. 1Password worked seamlessly until I loaded Mojave. Me Too! Touch ID not working on MacBookPro running Mojave. Mojave version 10.14 on a 2017 MacBook Pro (2017). Purchased the machine in March. No migration! I have absolut the same problem, Touch ID was working with 1Password the first time installed and after a reboot of my MacBook no more? then moved the old Keychain back. Rebooted, and then disabled, and enabled the Touch ID Option in 1Password, and now it works! Open the Terminal app from the /Applications/Utilities folder. You will be prompted to enter your macOS password. Nothing will appear as you type it. Press return once you have entered it, and then quit Terminal (Cmd+Q). Once complete restart your Mac. rebooted... still no Touch ID. rebooted... and now Touch ID is working. 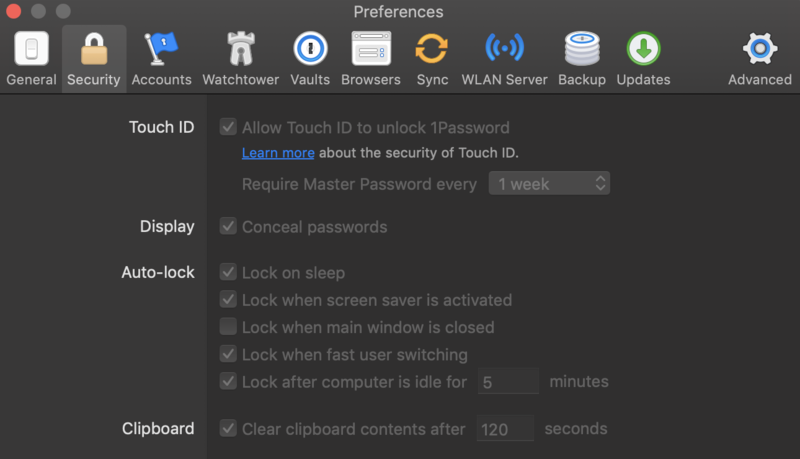 @kinseywilson - please try toggling Touch ID off and back on within System Preferences, then within 1Password 7 for Mac. Then Quit 1Password 7 Completely by typing ^⌥⌘Q (or just holding down the Control and Option keys as you choose Quit from the 1Password menu). Restart it, and turn Touch ID back on. Let me know if that works for you. Restart your Mac. Again, THIS WILL DELETE ALL OF YOUR KEYCHAIN DATA! macOS should recreate it after restarting, so that it includes the Secure Enclave data that Touch ID support depends on. It’s worthwhile to retain the Keychains folder that was moved to the Desktop in case it has any data that needs to be recovered. Unfortunately, no joy, Lars. In system prefs, I unchecked the three touch-ID options and deleted the two finger prints. Then restored touch ID (with new fingerprints). Then turned off Touch ID in 1PW and quit as instructed. Reopened and restored Touch ID within 1PW. Still doesn't recognize Touch ID. I'll try to keychain replacement that @KatjaS and @Lars suggested when I have time to do a backup. And post results here. @kinseywilson - sounds good; let us know how it goes. @kinseywilson - you're quite welcome. Glad it worked out for you. Disabling TouchID and full quitting 1PW and then recreating the Keychain per @Lars instructions worked for me. Trying to put back the old Keychain did not work after several careful attempts. As ~/Library/Keychains is owned by the logged in user, the sudo is not necessary. @dogboy - glad to hear you were able to get things straightened out! I have followed the instructions about moving and recreating the system keychain, but it does not work for me. Touch ID not working on MacBookPro running Mojave. I am 10.14 and 7.2.1. Touch ID works for all other apps, but not 1Password! Welcome to the forum, @dmbulfer! This is probably a silly question, but is Touch ID enabled in 1Password Preferences > Security? Yes, as I wrote, I went through the process of turning it off, rebooting, turning it on (w/o success), turning it off again, moving the keychain, rebooting, turning it on, etc. I'm sorry to hear that. In that case, the best thing to do would be to reinstall macOS, or, failing that, get in touch with Apple. We just don't have any control over the hardware or software that Touch ID depends on. I'm sorry, that does not make sense! TouchID works for EVERY other application. 1Password is the ONLY app for which it does not work! 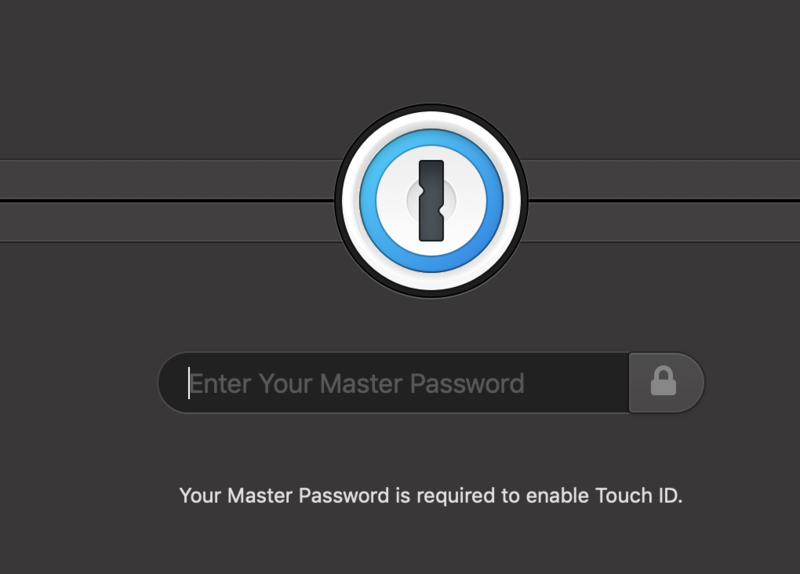 I once again toggled Touch ID off within System Preferences, quit 1Password 7 Completely by holding down the Control and Option keys as you choose Quit from the 1Password menu, then did "mv ~/Library/Keychains ~/Desktop", restarted my Mac, toggled Touch ID on within System Preferences and then, started 1Password. Now, TouchID works again. @dmbulfer: Glad to hear that you were able to sort out your Keychain issue as others described above! Touch ID no longer works on MacBook Air since update to Mojave 10.14.2. I have tried unchecking preference, re putting in finger prints, powering on and off. Nothing works. Please tell me how to fix. For me, the Touch ID option in 1Password Preferences is altogether disabled-- that is, the checkbox to enable it is unchecked and grayed out (and I did NOT uncheck it). Now I cannot enable it. I have been using touch ID the entire time I have had this machine (MacBook Pro, about 1 year old). I upgraded to Mojave quite a while ago, and am currently at version 10.14.2. I can use touch ID to log on to the machine. This morning I went to open 1PW and got the Touch ID interface, but my fingerprint failed three times, so I got the manual login screen, and used it. This has happened before, after machine restarts, as expected-- so I didn't worry too much. But now every time I use 1PW, there is no Touch ID offered to me. I then found in 1PW preferences that the Touch ID option was disabled entirely. Is it possible to re-enable the option in 1PW preferences? @Kjlasky - have you changed anything recently with respect to your user account on your MacBook Air? Reinstalled macOS, imported user accounts from other Macs via Migration Assistant or Time Machine, anything else of that nature? Touch ID doesn't typically just stop working; something has to go wrong or be changed. You mentioned updating to Mojave 10.14.2. Was that an incremental update from .1, or were you coming from a much earlier OS like macOS 10.13 (“High Sierra”) or earlier? It was an update from .1 to .2 on my new 2018 MacBook Air. I had to sign in and out of iCloud due to email issues from the update that Apple walked me through. Maybe some keychain stuff? I think it has to be something with the keychain? Can you give me the steps how to fix this or troubleshoot with me please? @Kjlasky - do you have a 1password.com account, or is your 1Password data standalone? Or both? I have a 1password family account. Can you please email me to troubleshoot? @Kjlasky - it looks like you've emailed us, and my colleague Duncan replied to you. If you didn't receive it, please check your Spam or Bulk email folder, as sometimes overzealous spam filters can mark unsolicited email from us as junk. Have not received any emails from Duncan. I checked my junk and trash. Been commenting with you since 8am and still no hint or you or anyone helping me. Can you or someone please email me directly again? @Kjlasky - I have just replied to your most-recent email - please check to see if you received it.